MANILA, Philippines – By midnight on Sunday, January 13, the election period starts with the implementation of a weapons ban and the activation of at least 1,634 election checkpoints across the country. The gun ban for the 2013 midterm polls, however, takes effect in a more politically charged environment than in past election cycles, given recent incidents of crime and the intensity of political rivalries that the President’s party faces. 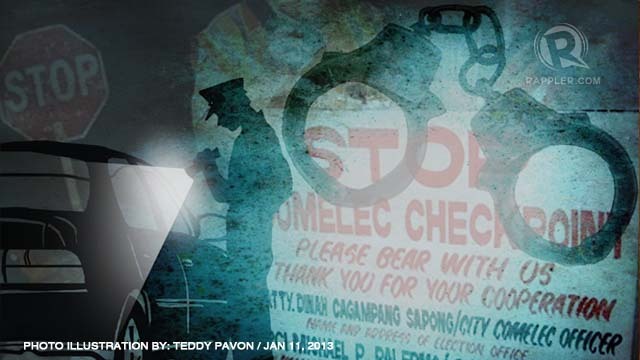 MANILA, Philippines – With at least 1,634 election checkpoints set up across the country in the next 5 months, what are the odds that you would be stopped at a checkpoint? High. In Resolution 9588, the Commission on Elections says the search and seizure procedures conducted at poll checkpoints should not violate the civil, political, and human rights of anyone being flagged. 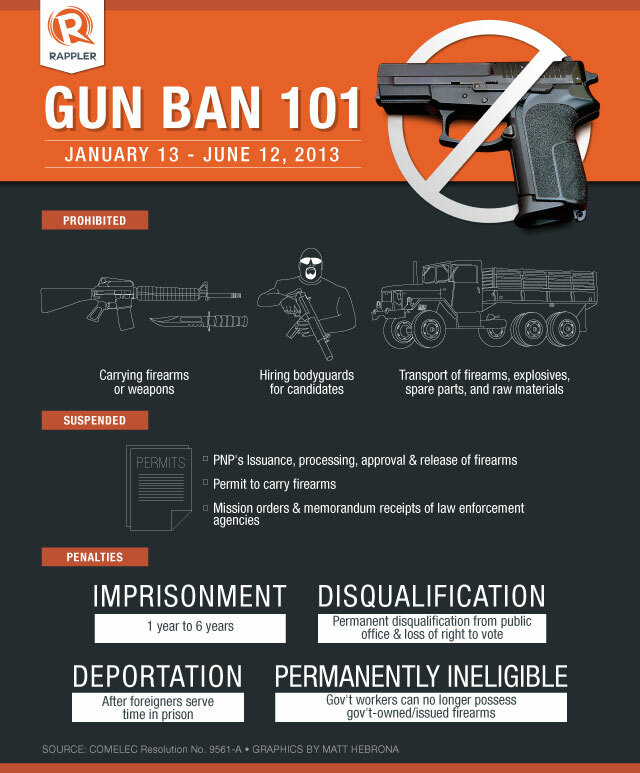 MANILA, Philippines – The Commission on Elections has ordered the setting up of police- or military-manned checkpoints for the “effective implementation” of the gun ban, which starts Sunday, January 13, and ends on June 12. MANILA, Philippines - Advocating "secure and fair elections," the Department of the Interior and Local Government (DILG) led a unity walk early Sunday, January 13, marking the official start of the 2013 election period. 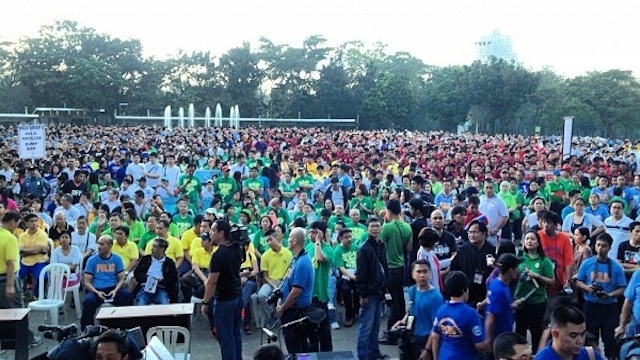 The unity walk, dubbed as the "SAFE 2013" campaign, started from several points in Quezon City, with representatives from the DILG, Philippine National Police, Commission on Elections, and non-government organizations participating. MANILA, Philippines – Sunday, January 13, started the longest political event in the country that happens every 3 years—the elections. 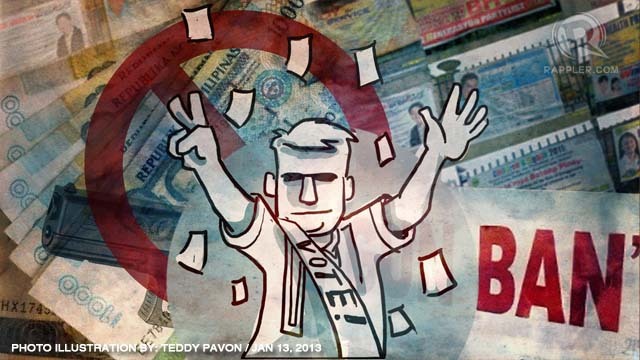 Taking effect within the election period are all sorts of prohibitions in and out of government and among political players that are more detailed and expansive than what some countries have.